Nitrogen is a nonmetal chemical element. The atmosphere contains more than 78 percent of nitrogen. It has the chemical symbol N and atomic number 7. Its stable inside typically contains 14 nucleons (7 protons and 7 neutrons). It has 5 electrons in its outer shell. Nitrogen is a colorless odorless gas at normal temperature. It is normally attached to another nitrogen atom, making a nitrogen molecule (N2). This bond is very strong. That is why many explosives contain nitrogen. The bond is broken when the explosive is made. When it explodes the bond forms, releasing a lot of energy. It turns into a liquid at -195.8°C and turns into a solid at -210°C. If it is compressed, it can be turned into a liquid without making it cold. It usually does not combine with other atoms because its strong bond prevents it from reacting. Lithium is one of the few chemical elements that react with nitrogen without being heated. Magnesium can burn in nitrogen. Nitrogen also makes blue electric sparks. The blue color is caused by the atoms being excited. When they get normal again, they release light. When nitrogen is excited, it reacts with many things that it does not normally react with. Many chemical compounds that are important for industrial purposes contain nitrogen ions. These include ammonia, nitric acid, nitrates and cyanides. Nitrogen comes in several oxidation states; -3, -2, -1/3, +1, +3, +4, and +5. Each of those oxidation states has its set of compounds. Compounds in the -3 oxidation state are weak reducing agents. These include ammonia, ammonium, amide and nitrides. Amino acids and proteins contain nitrogen in this oxidation state. Hydrazine, a compound in the -2 oxidation state, is a strong reducing agent. Azides contain nitrogen in the -1/3 oxidation state. They are extremely powerful reducing agents, and most are very toxic. Nitrous oxide contains nitrogen in the +1 oxidation state. It is used as an anesthetic. Compounds containing nitrogen in the +2 oxidation state, such as nitric oxide, are reducing agents. +3 oxidation state compounds are strong oxidizing agents and weak reducing agents. Nitrites are the most common +3 compounds. Compounds in the +4 oxidation state are strong oxidizing agents. They include nitrogen dioxide and dinitrogen tetroxide. Compounds containing nitrogen in the +5 oxidation state are strong oxidizing agents. They are one of the more common groups of nitrogen compounds. They include nitric acid and dinitrogen pentoxide. They also include nitrates, which are used in explosives such as dynamite, nitroglycerin and trinitrotoluene. Air is made up of about 78% nitrogen and about 20.95% oxygen, < 1% argon, and traces of other gasses such as carbon dioxide, and water vapor, among others. It is also in a few nitrates in the ground. Ammonium minerals are rare. Nitrogen is in proteins. 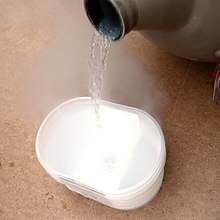 Pure liquid nitrogen can be made by cooling air. The nitrogen turns into a liquid at a different temperature than the oxygen. It can also be made by heating certain chemical compounds, such as sodium azide. Nitrogen is an element is used to prevent things from reacting with the oxygen in the air. It can be used to fill crisp bags and incandescent bulbs. It is also used to fill some tires. It can be used to make electric components like transistors. 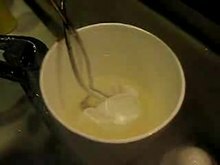 Liquid nitrogen can be used to freeze things. Nitrogen compounds have many uses, such as anesthetics (nitrous oxide), explosives (dynamite), cleaners (ammonia), and meat (protein), and planes (fuel). Nitrogen was discovered by Daniel Rutherford in 1772, who called it noxious gas or fixed gas. They discovered that part of air did not burn. It was found that animals died in it. It was known as "azote". Many nitrogen compounds also contain the "azide" or "azine" letters, such as hydrazine. In 1910, Lord Rayleigh found out that when a spark was passed through nitrogen, it made a reactive form of nitrogen. This nitrogen reacted with many metals and compounds. This page was last changed on 14 March 2019, at 18:53.